Since her first volunteer job at the Chemung County Historical Society in upstate New York at the age of 14, Linda Norris has been reflecting on museums’ transformative power. In 2017 she joined the Coalition as the Global Networks Program Director, leading our programmatic work in Asia; Africa; Europe; Latin America and the Caribbean; the Middle East and North Africa; and Russia, helping to build the capacity of members through trainings and workshops, cross-regional exchanges and advocacy campaigns. Co-author of Creativity in Museum Practice, Linda also offers trainings to equip members and other cultural organizations with the skills to facilitate conversation and action on the ways creativity can transform museums, shape more compelling narratives and create deeper, more inclusive community connections. A prolific writer and speaker, Linda blogs at The Uncataloged Museum and, in the interview below, shares her thoughts on how museums, historic sites, memory organizations, and other cultural organizations can use creative thinking to transform how both their communities and staff approach. For more information, or to book a Coalition creativity workshop at your organization, contact Linda Norris at lnorris@sitesofconscience.org. What is creativity and how can it benefit cultural and advocacy organizations? Creative organizations — and creative workers — produce new ideas and new ways of seeing things that add value both internally among staff and externally with public audiences. At its best, creative practice is really about freedom — the freedom to break boundaries, build on the old or try something completely new. It’s a democratic, performative act — sometimes performed alone and sometimes performed in concert with others. Both ways work! If we begin to think of creative practice like this — as a form of problem-solving — it’s easy to see why organizations need to be more creative. There are so many problems in the world — from very local issues within particular communities to global ones like climate change and human rights. No matter the scale, the more we as individuals and organizations think of creative ways to make a difference, the better our world will be. A survivor leading a discussion at Youth for Peace in Cambodia in December 2016. Thinking creatively can be a particularly useful tool for Sites of Conscience, as it is non-prescriptive at its core, as memory work in general should be. Artistic and creative practice is adaptable and something everyone can do. Throughout the world, many of our members are already engaging victims and survivors through creative means such as body-mapping and embroidery. 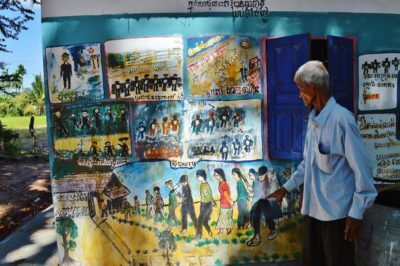 In Cambodia, Youth for Peace has used murals to share the stories of survivors of the Khmer Rouge, while at Terezín Memorial in the Czech Republic, theater productions are being used to engage young people. Creativity, however, also matters inside organizations: how can we collect and store documentation when our resources are limited? How can we create office space that encourages creative thinking? How can we find ways to protect the well-being of those we work with? Often creative work is seen as something elite, isolated and inaccessible to your “average” person: Proust writing in his cork-lined room, or Henry David Thoreau in his cabin in the woods. You don’t see it like that. How can people incorporate creativity into their everyday life? 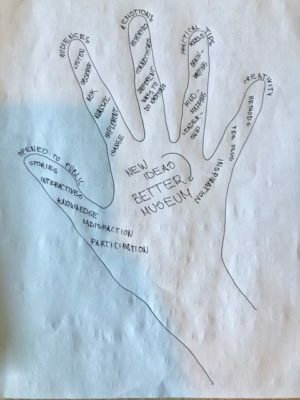 A participant at the Baltic Museology School reflected on their week-long journey through traces of their hand. Preparation, Incubation, Insight, Evaluation and Implementation. You might have five projects that are each in a different stage in the creative process. By understanding the stages and adjusting your daily habits to work with them you can strengthen your creative practice. There are many simple ways you can start enhancing your own creative practice – for instance, expand your information intake by reading different websites or take a different route to work tomorrow to observe new people and places. You’ve worked with hundreds of cultural organizations, including Sites of Conscience that prioritize engagement and advocacy through creativity. When it comes to sparking creativity, what does your ideal museum, historic space or cultural institution look like? I don’t have an ideal museum. I think the most meaningful museums are specific to time, place and community. I dislike museums that feel generic. I’ve already mentioned Youth for Peace and Terezín Memorial, which both do outstanding jobs activating the public through art. Another member, the Harriet Beecher Stowe Center in Hartford, CT, comes to mind here as well. Each one is completely different, but completely compelling and moving in its own way. 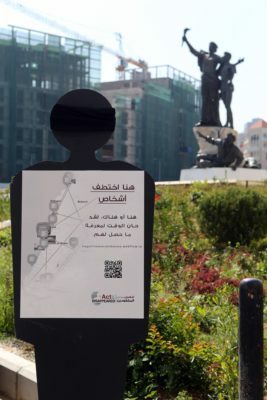 An exhibit by Coalition member Act for the Disappeared in Lebanon. I think it’s also important to note that the traditional concept of “museum” is a Western one, and may have little relevance to different communities around the world. And its Sites of Conscience members who are really pushing the ideas of “museum” and “exhibit” in new directions. Through pop-up exhibits and other means, Sites of Conscience like District Six in South Africa, Act for the Disappeared in Lebanon and the Parramatta Female Factory Precinct in Australia (to name just a few) are changing the face of museums through creativity – and making them more accessible and engaging in the process. It’s great to be able to share their inspirational, creative work in Sites of Conscience workshops with other members. What recommendations do you have for organizations, museums or sites that want to be more creative? Are there good first steps? I think a good first step for anyone is to become more aware of others — their needs, their perspectives, their strengths. For too long museums have assumed that they know best and have, honestly, hoarded power and been reluctant to undertake change. A very simple step is to begin by listening to others. Sometimes in our creativity workshops we literally send participants into the street for an afternoon to interview people about what they thought about museums. Similarly, Coalition member The Wing Luke Museum of the Asian Pacific American Experience in Seattle has a long-established tradition of sharing authority in community-curated exhibitions. Both strategies really go a long way in assisting the general public in thinking about engagement as something open to them. A Site of Conscience is in many ways always a work in progress in that we encourage new voices and new viewpoints. We grow this way and we also encourage people to actively engage in building a rights-based future. It’s not about just listening to people, but really having a willingness to move away from the idea that museums have all the answers. I believe we should have more questions than answers; and that visitors should leave a place inspired to learn more, with more questions, rather than with all the answers. My favorite stories about exhibits are when someone tells me that they talked about it when they got home! Finally, organizational leaders (from anywhere in the organization) can model and encourage creative practice —including learning from failure. You can be a creative leader no matter what your job. As a colleague and team member, you can share ideas, information and encourage others to do the same. Generosity is an incredibly important concept for the development of creative practice — and one we all can do! 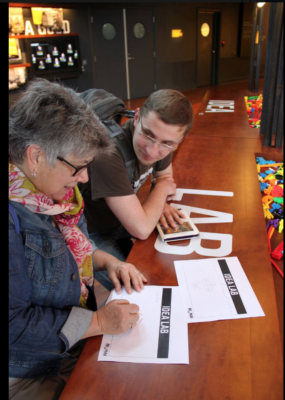 In your workshops, you ask participants if they could share a childhood museum memory. Could you share such a memory? What made it memorable? 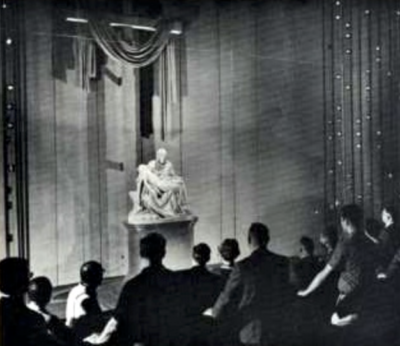 One important memory is the 1965 New York World’s Fair. I remember being on a long, crowded moving walkway to see Michelangelo’s Pieta. It was the first time in over four hundred years the artwork had left the Vatican. I don’t remember as much about the artwork as I do about the experience. When I saw the sculpture at the Vatican a few years ago, the memory came back along with a new appreciation for the work itself. It reminded me of the real power in place – and the power in authentic objects and documents. I’m continually moved by the stories, places and objects I encounter as I visit Sites of Conscience around the world, and that power — of the real and of the authentic — is a unique tool that we, as museums and memory organizations, have to use to create real change in the world. Creative practice can enhance this power and deepen those connections. I like to ask this question because it helps people reflect on what moves them on a personal level — and that is necessary for creative practice. Can you describe what a creative practice workshop looks like? What can participants expect? Every workshop is different depending on the audience. Some workshops are for a single institution in which the entire staff — from the maintenance crew to the director — participates to begin re-imagining new ways of thinking and working together. Often, this workshop might be part of a larger strategic planning or interpretive planning process. Other workshops are meant for museum colleagues who want to learn new skills to share with their own organizations. Others are for larger communities. This year I spoke to a standing-room-only audience in Tirana, Albania that included NGO professionals, librarians, students, tourist businesses and entrepreneurs, all interested in building their creative practice. No matter the audience though, workshops are always about “serious play.” They involve very little lecturing and lots of doing. I believe that when people have fun they learn better. Participants gain an understanding of an expanding circle of concepts: personal creative practice, organizational creative practice, and the ways that organizations can stimulate community creative practice. At the end of any Coalition workshop, whether it is two days or two hours, participants leave with simple tips to enhance creativity that can be put into practice right away. Depending on the workshop design, they also gain a deeper perspective on creativity in relation to their own work. For more information, or to book a creativity workshop at your organization, contact Linda Norris at lnorris@sitesofconscience.org.